I admit, the color scheme may make your eyes bleed. This year, under the name of my game development website Offbeat Games, I'm taking part in the One Game a Month challenge. True to its name, the goal of participating is to make one new game for each and every month in 2013. I realize that to some gamers out there, the impressive fruits of 48 or 72-hour game jams may have made it seem like making a great game in a matter of days is not especially difficult to do. And I suspect that for some really talented developers, putting together a great game in such a short span of time may not actually be all that challenging a task. But for the rest of us mortals out there, making a complete game in only a month's time is a pretty steep challenge. For me, and I suspect for many participants in the #1GAM challenge, the hope isn't to make a fantastic game, or even a very good game. Rather, the goal is simply to get better at making games through practice. So it is in that spirit that I decided to take part in the challenge, but like many others, I struggled to get my act together to produce a game for January. My original ambitions to create my first game for the year by learning a new programming language and developing for an unfamiliar platform proved to be a bad plan. With January almost gone, I made the decided to go back to a platform I knew well and make a simple, silly game. The result of this is now up on my gaming website: it's called Cat In The Pie, and if you keep your expectations low, you might find that playing it isn't the worst way to spend roughly two minutes of your life. As the name suggests, your main objective in the game is to keep your adorable but pesky cat out of your freshly baked pie. Just as the premise is simple, the mechanics are relatively simple, too. You control your elderly character using the arrow keys. You have to press each key quickly and repeatedly to move your character. And no, you can't simply hold the key down! You move left and right across your kitchen, trying to keep your dinner from burning and always keeping an eye on your pesky cat. I'm fairly pleased with the mechanics and how well they work with the game's overall concept and theme. 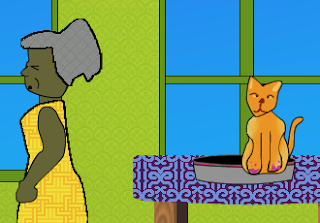 Having to press the arrow keys rapidly and repeatedly over the course of the two minutes is not as easy as it might seem, and I chose to make the main character in this game an elderly woman because I felt that the difficulty the player experiences in moving the character symbolically parallels the difficulty an aged and infirm person might experience in doing even such a seemingly simple task as walking across a room. As usual, however, I'm frustrated with the game's aesthetics. To put it quite simply, I am a terrible artist. Sadly, I suspect this game looks better than things I've created in the past, but it's still much more of an eyesore than it should be, given the amount of time I spent creating and tweaking the graphics. I know that these days, many programmers will try to get around their poor drawing skills using pixel art and I probably should too, but I think that style has been grossly overused. (Please developers, stop locking games into a boxy, blocky existence!!) And so it is out of sheer stubbornness that I refuse to use pixel art in my games. However, my resolve on this point weakens every time I produce a game as hideous as this one. The only thing I can say in defend of the game's visual styles it that the animation felt to me like it was both fluid enough when it needed to be (like when the cat bounds away) and appropriately halting in how the main character shuffles across the room, such that if you can get past the busy background and weird furniture, the graphics don't completely cripple the experience. Overall, I am actually happy with how Cat In The Pie turned out, and if I had made it in two days instead of slowly over the course of two weeks, I'd be downright proud of it. I wouldn't call it particularly educational, or even particularly interesting as a game, but I like that it is a game that tells a very basic, and yet unexpected, story. It's a story of everyday trials and tribulations, with a very simple goal and a fairly cliché winning ending, but one which I think seems less cliché when applied to such an a-typical video game character. After all, when was the last time you played a game whose main character was 1) female, 2) non-white, and 3) elderly? Not often, I suspect. Hopefully, this choice of character doesn't feel forced (personally, I thought this character fit so naturally with the theme and setting of the game that I couldn't really imagine her any other way), but I also hope that she is a character who can ultimately change our notions about who games and game stories can and ought to be about. I'd love it if you gave Cat In The Pie a whirl, and let me know your thoughts in the comments!